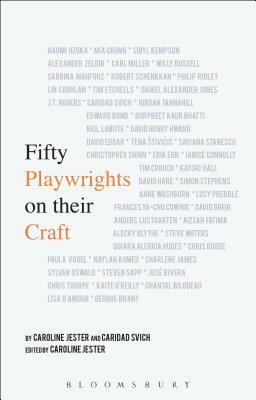 Fifty Playwrights on Their Craft (Paperback) | The Drama Book Shop, Inc.
Caroline Jester is a writer and dramaturg. She is a Fellow of the Institute of Creative and Critical Writing at Birmingham City University, UK, a Master on the MA in Dramatic Writing at Central Saint Martins, UK and has been Literary Manager and Dramaturg at the Birmingham Repertory Theatre, UK. Jester's publications include Europa (2013), Dramatic Writing Masterclasses: Key Advice from the Industry Masters (2017) and Playwriting Across the Curriculum (2011). Caridad Svich is a playwright, associate editor of Contemporary Theatre Review and founder of NoPassport theatre alliance and press. She received a 2012 OBIE Award for Lifetime Achievement and the 2011 American Theatre Critics Association Primus Prize for The House of the Spirits.She has edited several books on theatre including Audience Revolution and Innovation in Five Acts (2016 & 2015), Out of Silence: Censorship in Theatre & Performance (2014), and Trans-Global Readings (2004).